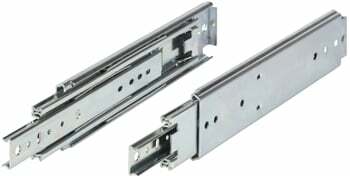 30 inch to 60 inch long heavy duty drawer slides with weight capacities up to 500 Lbs. 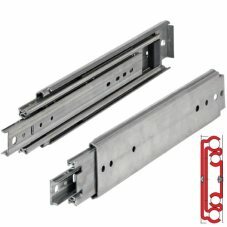 Extra long heavy duty drawer slides require unique components for their unique applications. If a drawer is built to extend as far a 60'', for example, you must invest in a drawer slide to match this capability. Most drawer slides within this size range are used in commercial and industrial projects, as well as mobile applications such as RV’s, utility truck tool boxes, fire trucks, ambulances, and expedition vehicles. OVIS' super long 30'' to 60'' drawer slides are able to meet these needs, and do much more. A weight capacity of 140 lbs is more than enough to meet most storage needs. This is by far the lowest weight capacity for OVIS' 30'' to 60'' drawer slides. Most of our 30'' to 60'' drawer slides can handle up to a quarter ton of weight. That's 500 pounds! The way in which one's extra large drawers are used can vary greatly. That is why OVIS makes sure to provide 30'' to 60'' drawer slides to meet every need. A couple of examples of the uses of this collection include locking capabilities at any point of extension and full extension capabilities that make the entire slide fully accessible. All of OVIS' 30'' to 60'' drawer slides are heavy duty and include a zinc finishing. Produced by top manufacturer Hettich, you can expect this toughness to last for many years. To learn more about OVIS' super long drawer slides, feel free to browse our products online and call or email us with questions. Our technical service department is skilled in assisting with compatibility questions of these drawer slides for your unique project needs. 750mm (29-1/2") Heavy Duty Stainless Steel Drawer Slide, 53 mm, 155lb. The Sugatsune 5302-750 is a 750 mm (29-1/2") full extension stainless drawer slide with a 149 lb. per pair weight capacity. The 304 grade stainless drawer slides are ideal for use in damp, corrosive, coastal and marine applications such as boats, beach houses, laboratories, locker rooms, etc. Telescoping precision full extension slides for high loads, up to 500 lb. capacity. Tested Weight Cap. 380 lbs. @ 10,000 Cycles - 274 lbs. @ 75,000 Cycles. Price is per pair. Screws not included. Installation Width: 3/4" (19mm) (each side), Height: 3" (76mm). The Fulterer FR777, Heavy Duty 30" Pantry Slide, makes for an easy installation of a custom roll out pantry. The FR 777 model is designed for large full height pantry pull-outs, up to 450 lbs. Optional Soft Close available. 800mm (31-1/2") Heavy Duty Stainless Steel Drawer Slide, 53 mm, 140lb. The Fulterer FR777, Heavy Duty 32" Pantry Slide, makes for an easy installation of a custom roll out pantry. The FR 777 model is designed for large full height pantry pull-outs, up to 450 lbs. Optional Soft Close available. The Fulterer FR777, Heavy Duty 34" Pantry Slide, makes for an easy installation of a custom roll out pantry. The FR 777 model is designed for large full height pantry pull-outs, up to 450 lbs. Optional Soft Close available. Telescoping precision full extension slides for high loads, up to 500 lb. capacity, with cushioned in and out stops. 3/4" Installation Width - 3" Height. Tested Weight Cap. 348 lbs. @ 10,000 cycles - 226 lbs. @ 75,000 cycles. The Fulterer FR777, Heavy Duty 36" Pantry Slide, makes for an easy installation of a custom roll out pantry. The FR 777 model is designed for large full height pantry pull-outs, up to 450 lbs. Optional Soft Close available. The Fulterer FR777, Heavy Duty 38" Pantry Slide, makes for an easy installation of a custom roll out pantry. The FR 777 model is designed for large full height pantry pull-outs, up to 450 lbs. Optional Soft Close available. Telescoping precision full extension slides for high loads, up to 500 lb. capacity, with cushioned in and out stops. Chromated steel. Runner and ball race form a single non-detachable unit. Smooth action and high side stability through precision slide. Ball spacers made of noise-absorbing plastic with hardened steel balls. PRICE IS PER PAIR. Screws not included. 3/4" Installation Width - 3" Height. Tested Weight Cap. 320 lbs. @ 10,000 cycles - 210 lbs. @ 75,000 cycles. The Fulterer FR777, Heavy Duty 40" Pantry Slide, makes for an easy installation of a custom roll out pantry. The FR 777 model is designed for large full height pantry pull-outs, up to 450 lbs. Optional Soft Close available. Telescoping precision full extension slides for high loads, up to 500 lb. capacity, with cushioned in and out stops. Chromated steel. Runner and ball race dorm a single non-detachable unit. Smooth action and high side stability through precision slide. Ball spacers made of noise-absorbing plastic with hardened steel balls. PRICE IS PER PAIR. Screws not included. 3/4" Installation Width - 3" Height. Tested Weight Cap. 320 lbs. @ 10,000 cycles - 200 lbs. @ 75,000 cycles. Telescoping precision full extension slides for high loads, up to 500 lb. capacity, with cushioned in and out stops. Chromated steel. Runner and ball race form a single non-detachable unit. Smooth action and high side stability through precision slide. Ball spacers made of noise-absorbing plastic with hardened steel balls. PRICE IS PER PAIR. Screws not included. 3/4" Installation Width - 3" Height. Tested Weight Cap. 320 lbs. @ 10,000 cycles - 200 lbs. @ 75,000 cycles. The Fulterer FR777, Heavy Duty 44" Pantry Slide, makes for an easy installation of a custom roll out pantry. The FR 777 model is designed for large full height pantry pull-outs, up to 450 lbs. Optional Soft Close available. The Fulterer FR5400, 58" Heavy Duty Drawer Slide is made of zinc plated, cold rolled steel and have a 3/4" installation width. They have stainless steel ball bearings and plastic ball spacers to reduce friction. This is a non-detachable slide. This 48" model has a dynamic weight capacity of 330 lbs. or 150 kg.. The Fulterer FR5400, 56" Heavy Duty Drawer Slide is made of zinc plated, cold rolled steel and have a 3/4" installation width. They have stainless steel ball bearings and plastic ball spacers to reduce friction. This is a non-detachable slide. This 48" model has a dynamic weight capacity of 330 lbs. or 150 kg.. The Fulterer FR5400, 54" Heavy Duty Drawer Slide is made of zinc plated, cold rolled steel and have a 3/4" installation width. They have stainless steel ball bearings and plastic ball spacers to reduce friction. This is a non-detachable slide. This 48" model has a dynamic weight capacity of 374 lbs. or 170 kg.. 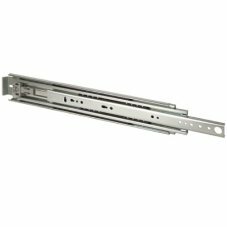 The Fulterer FR5400, 52" Heavy Duty Drawer Slide is made of zinc plated, cold rolled steel and have a 3/4" installation width. They have stainless steel ball bearings and plastic ball spacers to reduce friction. This is a non-detachable slide. This 48" model has a dynamic weight capacity of 374 lbs. or 170 kg.. This Fulterer FR5400 has a weight capacity of 396 lbs., 44" Heavy Duty Drawer Slide is made of zinc plated, cold rolled steel and have a 3/4" installation width. They have stainless steel ball bearings and plastic ball spacers to reduce friction. This is a non-detachable slide. The Fulterer FR5400, 48" Heavy Duty Drawer Slide is made of zinc plated, cold rolled steel and have a 3/4" installation width. They have stainless steel ball bearings and plastic ball spacers to reduce friction. This is a non-detachable slide. This 48" model has a dynamic weight capacity of 396 lbs. or 180 kg.. This Fulterer FR5400 has a weight capacity of 440 lbs., 46" Heavy Duty Drawer Slide is made of zinc plated, cold rolled steel and have a 3/4" installation width. They have stainless steel ball bearings and plastic ball spacers to reduce friction. This is a non-detachable slide. This Fulterer FR5400 has a weight capacity of 440 lbs., 44" Heavy Duty Drawer Slide is made of zinc plated, cold rolled steel and have a 3/4" installation width. They have stainless steel ball bearings and plastic ball spacers to reduce friction. This is a non-detachable slide. The Fulterer FR5400 has a weight capacity of 440 lbs. 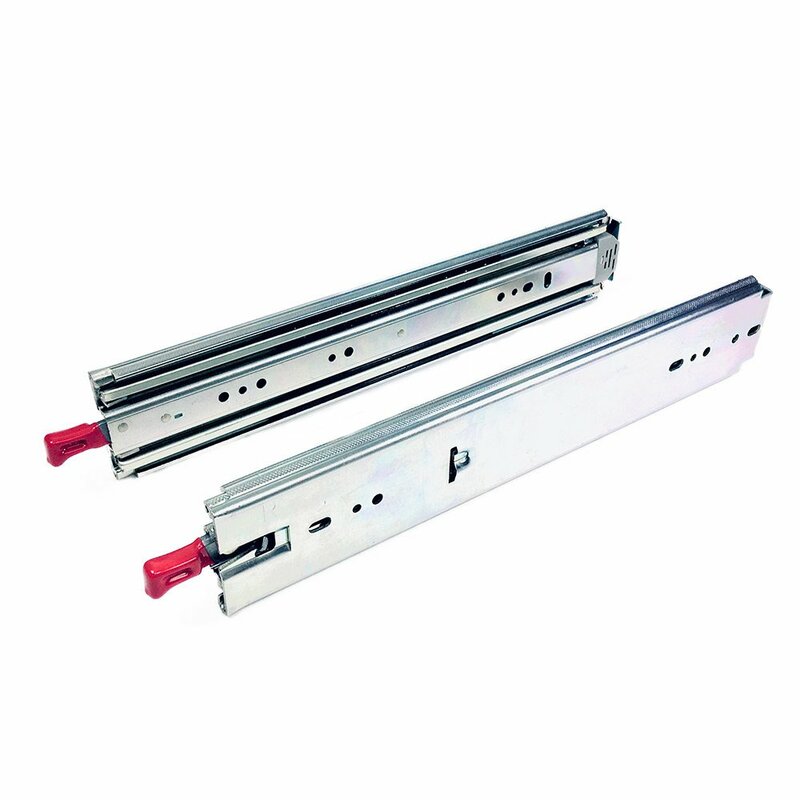 , 42" Heavy Duty Drawer Slide is made of zinc plated, cold rolled steel and have a 3/4" installation width. They have stainless steel ball bearings and plastic ball spacers to reduce friction. This is a non-detachable slide.